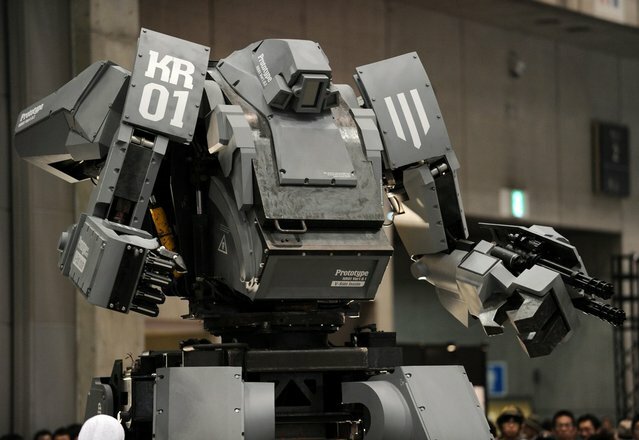 A Japanese company called Suidobashi Heavy Industries recently revealed its 13-foot mech robot named Kuratas. Kuratas robot is the brainchild of artist Kogoro Kurata and robotics researcher Wataru Yoshizaki. Kuratas robot can be controlled in three ways – either through a controller, a master slave, or an iPhone. The robot runs on an operating system called V-Sido and it is outfitted with a launcher and a twin Gatling gun. To operate the robot’s heavy artillery, the user only needs to smile to fire 6,000 bullets per minute. Sounds too good to be true doesn’t it? Apparently while we have pretty much covered almost every robot around, Kuratas robot appears to be a concept to us for now. But I have to say that the robot looks very surreal and realistic, judging from the video above. The Kuratas mech robot was recently showcased at the Wonder Festival in Chiba, Tokyo. Suidobashi Heavy Industries is reportedly planning to mass produce Kuratas in the future, but I reckon that you take that with a grain of salt in hand.